An essay is only as valuable and effective as its ability to communicate its thesis. A well-thought-out essay on an interesting topic loses its fire and its ability to persuade if it is not properly written according to the rules of Standard English. Errors in punctuation, for example, detract from the reader’s ability to understand what the writer is attempting to communicate. The same holds true for other errors in terms of mechanics, style, and flow. The body of the essay should provide valid sources that support the thesis statement. The cited sources should follow the professor's selected writing style: APA, ASA, AMA, MLA, Chicago, CSE, Turabian, AP, Harvard, etc. 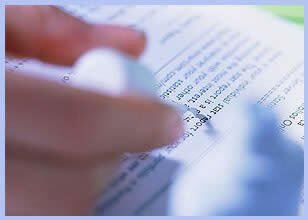 Essay corrections can ensure that a well-thought-out-essay communicates its message to the reader. Good editing enhances the effectiveness of your essay. It is extremely important to follow the professor's instructions. A solid essay correction does not guarantee an A; the writer must follow all directions. In addition, it is important to keep opinions to a minimum and to expand ideas using valid sources. Proof-Reading.com will make certain that the essay adheres to all grammar and punctuation rules by performing an extensive essay correction. In addition to correcting grammatical errors, our editors will verify that your thesis is sound and that the body of your essay supports your thesis. Finally, the organization and transitions of your essay will be evaluated to ensure that your argument develops logically.